Tuesday's patch to World of Warcraft introduced new content and tweaks to the land of Azeroth, but with it came an important change to The Warden, Blizzard's ill-famed tool against cheaters. 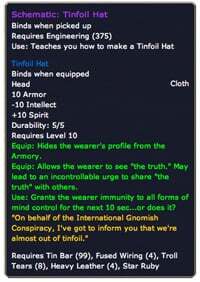 According to Warden-watching modders, the latest version is now encrypted, adding a major barrier for tinfoil hats who track what information the application sends home to Blizzard. The Warden's function as an anti-hacking sentry was already cause for concern for some privacy advocates. From the moment players log into the game, The Warden checks open window names, process names, memory modifications, DDL names and other pieces of data in the background. The goal is to determine if the user has a specific hack or program loaded and sends back a "yes" or "no" answer to Blizzard. At any given time, there is one version of The Warden active in a set of WoW servers. But Blizzard fights would-be countermeasures against The Warden by switching between hundreds of different copies of The Warden with the same functionality, but containing slight modifications in the code. This technique of polymorphic code is more commonly applied in computer viruses and worms as a way to avoid detection from anti-virus and intrusion detection software. According to The WardenNet , a website dedicated to tracking the iterations of the application, there are about 320 copies of The Warden in circulation. There are some legitimate arguments for the intrusion of privacy. Massive Multiplayer economies such as WoW can be ravaged by gold-farming bots or hacks. It's Blizzard's responsibility to not only protect the game experience, but their intellectual property and marketability of the game. And nothing, after all, is forcing anyone to play if they disagree with the policy. Blizzard maintains that The Warden does not gather any personally identifiable information about the player. They claim only information about the account is sent back. Third-party applications such as The Governor and ISXWarden could previously monitor The Warden and curtail activities the authors deem invasive. But with Blizzard now utilizing a different random cryptographic hash function in every copy of The Warden, customers lose that potential safeguard. On one hand, most customers have already put a large amount of trust in the company by giving Blizzard their credit card to pay the monthly fee. On the other, this could theoretically give Blizzard access to other pieces of private information without customer knowledge. Such a scenario may be a stretch, but the change is indicative of the leaps of faith some companies are asking (and too often not asking) their customers to make in order to protect their software.